This is a living room we recently designed at a Newport Beach condo. I wanted to create an ecclectic but sophisticated beach cottage look using refurbished vintage pieces. 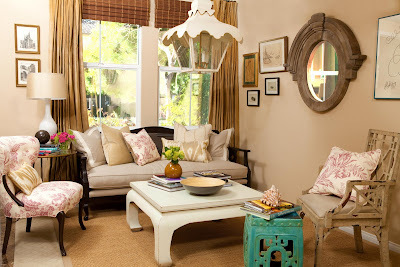 Most all of the furnishings in the room are vintage, including the lamp, mirror, and artwork. The fabulous hanging lantern is designed by my good friend Coleen at Coleen & Co. (available in different sizes, colors, and also as wall sconces). Speaking of hanging light sources, don't underestimate what chandeliers or pendant lights can do for a space. They add another dimension to the room and help unify the ceiling with the walls and floor. Photography by the lovely Tanni Tronson of LoveBug Portraits. Britt, I love it. If we ever have lots of money I am going to pay you to do my decorating. Mandy, sounds good, I can't wait! Hi Britttany! Been thinking about you. Well done it your designing. Miss you. Hope all is well.